"Before you came there was love, loyalty, and pride in the family. And then you came and you brought hate, lies, and suspicion. Once this house was strong and good, and you brought evil to it!" 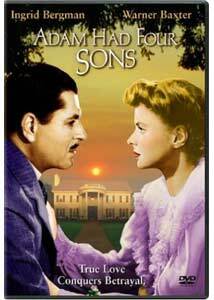 A lush and surprisingly engrossing domestic drama, Adam Had Four Sons stars a fresh-faced Ingrid Bergman in only her second American motion picture. The young Swedish actress plays opposite seasoned pro Warner Baxter, and earns top billing for the first time. With her sensitive, restrained portrayal of a long-suffering governess who devotes her life to a wealthy Connecticut family in the early 1900s, Bergman proves herself worthy of the honor, and helps Gregory Ratoff's film successfully navigate the slippery slope of melodrama. Sure, the movie possesses dated elements, but how many 63-year-old Hollywood films don't? The drama opens at the lavish country estate of the Stoddard family, as father Adam (Baxter) and wife Molly (Fay Wray) await with their four strapping boys the arrival of their new French governess, Emilie Gallatin (Bergman). Emilie's warmth and high spirits charm the entire family, and she's instantly accepted into the fold. Yet tragedy soon strikes, as Molly succumbs to one of Hollywood's nameless illnesses, but not before she wrings a deathbed promise from Emilie to look after her brood. The stock market crash of 1907, however, wipes out the family fortune and forces the Stoddards to abandon their home and move to a small New York apartment. With no money to pay her salary, Emilie is tearfully sent back to Paris. Ten years pass and the Stoddard finances rebound. The boys have grown into men and enlisted in World War I, but Adam still summons Emilie (who's apparently been sitting around for a decade twiddling her thumbs), and she happily rejoins the family. Her joy, however, is severely dampened when son David (Johnny Downs) arrives home with his new bride Hester (Susan Hayward), a vivacious beauty who cleverly hides her devious, predatory nature from everyone except the subservient Emilie. Hester replaces Emilie as lady of the house, and while David is off at war, she replaces him, too, seducing his older brother Jack (Richard Denning). To save the family honor, Emilie covers for Hester, which jeopardizes her growing yet unspoken love for Adam. There's no denying the sudsy elements that pervade Adam Had Four Sons, but it's a well made, emotionally involving soap that possesses first-class production values. Such a point is worth noting, considering Columbia's reputation at the time. The studio made only one or two "A" pictures per year, and Adam was definitely its standard-bearer in 1941. Today, however, much of the film's fun is derived from witnessing the emergence of two of Hollywood's finest actresses (Bergman and Hayward), as well as the work of two lesser stars forever linked to a pair of iconic 1933 films�and not known for much else. Although Baxter won one of the very first Best Actor Oscars� back in 1929, he's best remembered as Broadway director Julian Marsh in 42nd Street, bellowing the now-famous line to Ruby Keeler, "You're going out there a youngster, but you've got to come back a star!" Fay Wray, of course, will always be known for her ear-piercing screams as she desperately struggles to wriggle out of a giant ape's gargantuan paw in King Kong. But in Adam Had Four Sons, both Baxter and Wray remind us that, first and foremost, they're actors, not caricatures, and they perform with grace and style. Adam, however, is Bergman's picture all the way, and though she doesn't yet exhibit the commanding presence and sophisticated ease that would mark her later work, she easily grabs focus from everyone else on screen. It's often difficult to reconcile the irresistibly wholesome, still tentative Bergman of this film with the glamorous, worldly, and mature woman she would portray in Casablanca only a year later, but such is the transformative power of film. Although Hayward tries her best to steal the movie, Bergman emerges victorious in a far more sedate role, with her quiet strength besting Hayward's brazen manipulations. Their scenes together, however, are the highlight of the film, and they crackle with a simmering intensity and barely repressed revulsion in the grand tradition of female confrontation. It's fascinating to watch these two young actresses hone their craft and mold their personas on screen, especially with our built-in knowledge of the lofty heights both would later achieve. Of the two, Hayward is noticeably more raw and inexperienced, but she wisely recognizes the limits of her talent. She rarely overacts, despite having to flirt, seduce, lie, scheme, and even play a tricky drunk scene. Although her road to bona fide stardom would be far more bumpy and lengthy than that of Bergman (who enjoyed a meteoric rise), it's impossible to dismiss Hayward as just another ing�nue after seeing this film. Of course, it would be easy to dismiss and even ignore Adam Had Four Sons altogether. Yet when viewed in its proper context, it remains an entertaining rarity and a fine collector's item for anyone who appreciates the great actresses of Hollywood's Golden Age. Image Transfer Review: Another of Columbia's classics to undergo high-definition remastering, Adam Had Four Sons possesses less surface wear than other similar releases from the studio, which makes the admirable clarity and contrast more impressive. Plenty of marks, blotches, lines and grit still intrude, but the image's vibrancy manages to override any distractions. The beautiful close-ups of both Bergman and Hayward are the transfer's high points, although the clear picture also brings out greater detail in the lavish set decorations. The transfer enjoys good gray level variance, and edge enhancement seems altogether absent. A good effort overall. Audio Transfer Review: The original mono track holds up well, with age-related defects kept to a minimum. Dialogue is easy to comprehend and levels remain consistent throughout. Fans of old-fashioned domestic dramas and Golden Age classics will embrace Adam Had Four Sons for its engaging story and fine ensemble work. A young Ingrid Bergman and even younger Susan Hayward both impress with top-flight performances, adding tremendous luster to this minor but winning film. Recommended.